“Apec 2013: U.S. Shutdown Fears Perturb Apec Summit,” The Straits Times, October 6, 2013. Available at http://www.straitstimes.com/the-big-story/asia-report/indonesia/story/apec-2013-us-shutdown-fears-perturb-apec-summit-20131006 (accessed March 28, 2014). Boot, Max, “Obama’s Disappearing Pacific Pivot,” Commentary, January 29, 2014. Available at http://www.commentarymagazine.com/2014/01/29/obamas-disappearing-pacific-pivot-state-of-the-union/ (accessed April 9, 2014). Bosco, David, “What Divides Neocons and Liberal Interventionists,” Foreign Policy, April 9, 2012. Available at http://bosco.foreignpolicy.com/posts/2012/04/09/what_divides_neocons_and_liberal_interventionists (accessed April 9, 2014). “China’s Disappointment: The Fight against Terrorism Will Dominate the APEC Meeting,” The Economist, October 18, 2001. Available at http://www.economist.com/node/825358 (accessed June 24, 2013). Clinton, Hillary “America’s Pacific Century,” Foreign Policy, October 11, 2011. Available at http://www.foreignpolicy.com/articles/2011/10/11/americas_pacific_century?page=full (accessed March 17, 2014). Ewing, Philip, “Obama’s Asia Pivot: A Work in Progress,” Politico, April 20, 2014. Available at http://www.politico.com/story/2014/04/barack-obama-asia-pivot-105842.html (accessed April 24, 2014). Fukuyama, Francis, “After Neoconservatism,” The New York Times, February 19, 2006. Available at http://www.nytimes.com/2006/02/19/magazine/neo.html?pagewanted=print&_r=0 (accessed April 9, 2014). Good, Chris, “The Obama Doctrine: Multilateralism With Teeth,” The Atlantic, December 10, 2009. Available at http://www.theatlantic.com/politics/archive/2009/12/the-obama-doctrine-multilateralism-with-teeth/31655/ (accessed March 17, 2014). Gowan, Richard and Bruce Jones, “Mr. Obama Goes to New York: The President and the Restoration of Multilateral Diplomacy,” Brookings Report, September 17, 2009. Available at http://www.brookings.edu/research/reports/2009/09/obama-united-nations-jones (accessed March 27, 2014). Harry Kazianis, “America’s AirSea Battle vs. China’s A2/AD: Who Wins?,” The Diplomat, July 19, 2013. Available at http://thediplomat.com/2013/07/americas-airsea-battle-vs-chinas-a2ad-who-wins/ (accessed April 24, 2014). Kagan, Robert, “Multilateralism, American Style,” The Washington Post, September 13, 2002. Available at http://carnegieendowment.org/2002/09/13/multilateralism-american-style/2poj?reloadFlag=1 (accessed April 24, 2014). Kan, Shirley A., “U.S.-China Counterterrorism Cooperation: Issues for US Policy,” Congressional Research Service, July 15, 2010. Available at http://www.fas.org/sgp/crs/terror/RL33001.pdf (accessed June 17, 2013). Kassim, Yang Razali, “East Asia Summit 2012: Asia’s Power Game Unfolds,” East Asia Forum, December 12, 2012. Available at http://www.eastasiaforum.org/2012/12/12/east-asia-summit-2012-asias-power-game-unfolds/ (accessed April 29, 2014). Keck, Zachary, “Shutdown Forces Obama to Cancel Malaysia Trip, APEC May Be Next,” The Diplomat, October 2, 2013. Available at http://thediplomat.com/2013/10/shutdown-forces-obama-to-cancel-malaysia-trip-apec-may-be-next/ (accessed April 24, 2014). —, “U.S. Swears Asia Pivot Isn’t Dead,” The Diplomat, April 2, 2014. Available at http://thediplomat.com/2014/04/us-swears-asia-pivot-isnt-dead/ (accessed April 23, 2014). Kyle, William, “The U.S. Navy and the Pivot: Less Means Less,” The Diplomat, March 31, 2014. Available at http://thediplomat.com/2014/03/the-us-navy-and-the-pivot-less-means-less/ (accessed April 24, 2014). Lincoln, Edward J., “The Bush Second Term and East Asian Economic Regionalism,” JCER (Japan Center for Economic Research), undated. Available at http://www.jcer.or.jp/eng/pdf/EJ.Lincoln0503.pdi (accessed March 28, 2014). Obama, Barack, “Remarks by President Barack Obama at Suntory Hall,” The White House: Office of the Press Secretary, November 14, 2009. Available at http://www.whitehouse.gov/the-press-office/remarks-president-barack-obama-suntory-hall (accessed April 8, 2014). “Overview of ASEAN-US Dialogue Relations,” www.asean.org, undated. Available at http://www.asean.org/news/item/overview-of-asean-us-dialogue-relations (accessed March 28, 2014). Reynolds, Isabel and Maiko Takahashi, “U.S. Japan Remain Divided on TPP Deal Weeks before Obama Visit,” Bloomberg, April 10, 2014. Available at http://www.bloomberg.com/news/2014–04-10/u-s-japan-remain-divided-on-tpp-deal-weeks-before-obama-visit.html (accessed April 24, 2014). Sirila, Aaron, “Clinton: “Renewed American Leadership in Asia,” Asia Matters for America (East-West Center), November 4, 2010. Available at http://asiamattersforamerica.org/asia/clinton-renewed-american-leadership-in-asia (accessed June 27, 2013). Swaine, Michael D., “America’s Asia Pivot Threatens Regional Stability,” The National Interest, December 7, 2011. Available at http://nationalinterest.org/commentary/washington-destabilizes-sino-american-relations-6211?page=l (accessed April 24, 2014). Symons, Emma-Kate, “ASEAN Anger at Snub by Rice,” The Australian, July 28, 2007. Available at http://www.theaustralian.com.au/archive/news/asean-anger-at-snub-by-rice/story-e6frg6t6–1111114037879 (accessed March 28, 2014). Tan, See Seng, “Competing Visions: EAS in the Regional Architecture Debate,” East Asia Forum, November 15, 2011. Available at http://www.eastasiaforum.org/2011/11/15/competing-visions-eas-in-the-regional-architecture-debate/ (accessed June 27, 2013). Taylor, Lenore, “Changing Fortunes Dictate Another Presidential Pivot,” The Sydney Morning Herald, November 17, 2011. Available at http://www.smh.com.au/federal-politics/political-opinion/changing-fortunes-dictate-another-presidential-pivot-20111117–1nk3t.html (accessed April 17, 2014). Tiezzi, Shannon, “Has Obama Abandoned the Pivot to Asia?,” The Diplomat, January 20, 2014. 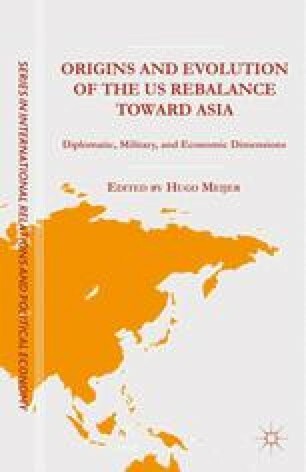 Available at http://thediplomat.com/2014/01/has-obama-abandoned-the-pivot-to-asia/ (accessed April 8, 2014). “U.S. To Resume Select Military Assistance to Indonesia,” usinfo.state.gov, November 25, 2005. Available at http://www.fas.org/asmp/resources/govern/109th/MilAidlndonesia22Nov05.htm (accessed April 24, 2014).